For lunch on New Year’s Eve, the huz and I decided to try a new restaurant in town – Frita Batidos! This new Cuban-inspired establishment (though if you read the restaurant’s philosophy, posted on their website and also inside the actual establishment, the owner is adamant that “this is not a Cuban restaurant,” but rather Cuban-inspired, with a menu that is “all its own”) was opened by local foodie celebrity Eve Aronoff, owner of Ann Arbor’s “eve” restaurant, who was also a contestant on Bravo’s Top Chef. Upon entering Frita Batidos, I was immediately struck by the stark white – everywhere! Everything was WHITE. Well good morning to you too! It was a very clean (both literally and in terms of the design), crisp, and casual, non-fussy atmosphere. Seating consisted of long white picnic tables, and a few stool seats along the front window and a rear wall. I love reading menus. This menu threw me a bit. It’s not the most straightforward menu I’ve seen in terms of layout and piecing a meal together, but I did appreciate the “glossary” posted beside the front counter. Having already perused the menu online before visiting, something I tend to do before visiting a restaurant since I am known to stew over menus, I had an idea about what I wanted to order. The person taking our order was helpful and offered suggestions. After ordering, we had a seat at the end of one of the picnic tables for 5-10 minutes, and were brought out our food, shown below. During our brief wait, our picnic-table neighbors, two delightful women, kindly offered us their leftover Churros with chocolate sauce, which we gladly accepted, especially after their promise that no double-dipping had taken place. There are still nice people out there! Tom and I both ordered a “Frita,” which is basically a Cuban burger. I ordered the Fish Frita, served with “lemon-scented mayo” and topped with fries on a buttery brioche bun, and also added Cilantro Lime Salsa on top (sometimes I get crazy and order cilantro-containing foods… cilantro and I have a complicated relationship). The Chorizo Frita was the hub’s choice – again on a brioche bun with “sweet chili mayo,” and topped with fries. His was delicious, and if I were to order a Frita again, I would probably get the Chorizo one. It was super spicy and packed with flavor. The Fish Frita, shown below, was delicious – it was evident all the ingredients were of high quality and combined to create a rather delicious sandwich. The fish was rather mild, but enhanced by some herb action and the bright lemon mayo. The fries on top were tasty, but I didn’t feel they added a whole lot to the sandwich. I took several out and ate them on their own! On the side, we split an order of “Twice Fried Ripe Plantains,” which were “tossed with cilantro-garlic butter, served with sweet chili mayo.” These were bangin’!! And by “bangin’”, I mean incredible! So utterly flavorful. The outside was crisp and savory, while the interior was creamy with a subtle sweetness. I will be coming back for more of these!! 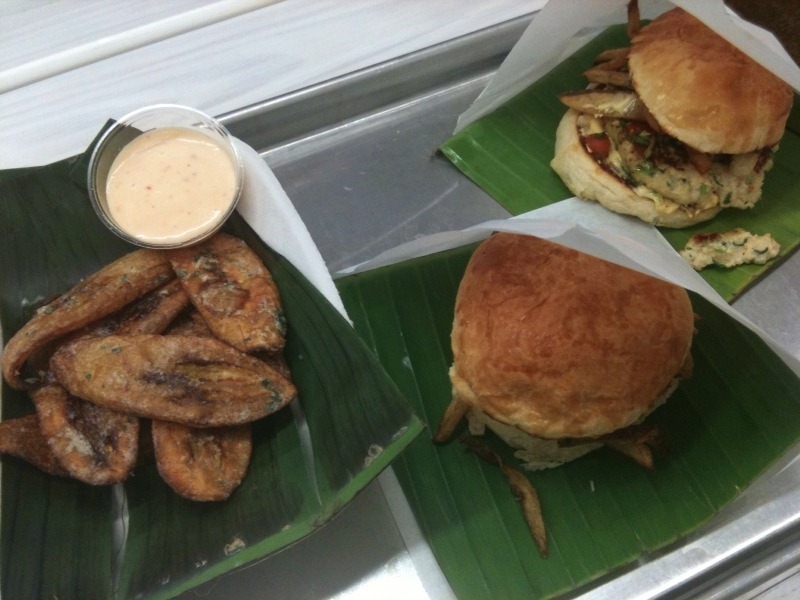 All in all, we really enjoyed Frita Batidos. We received good service, met nice people, and had delicious food. The prices were a tad high in relation to the portion sizes, but we didn’t mind paying the price since the food was clearly of high-quality (and delicious). I already know what I want to order next time we go – and I must try one of the beverages, either a batido, a tropical milkshake, or else one of the intriguing coffee drinks. 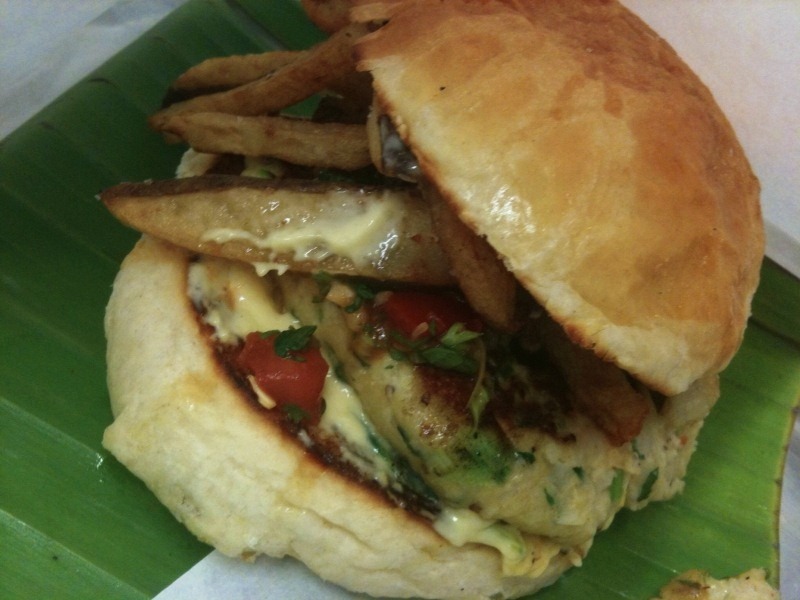 UPDATE: Read about my second visit to Frita Baditos HERE. LOVE fried plantains. And that fish sandwich looks ridic! Yum. 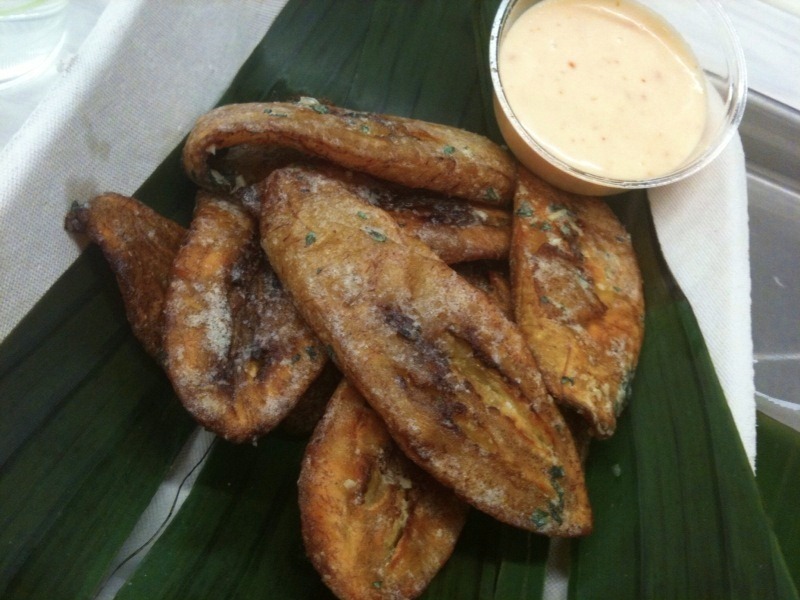 Mmm fried plantains ARE the best! might be something for your library. Pingback: Mini Ham ‘n’ Cheese Frittatas « Meg.Goes.Nom.Nom. Pingback: Spicy Beans ‘n’ Rice « Meg.Goes.Nom.Nom. Pingback: Halloween Weekend 2011–Part I « Meg.Goes.Nom.Nom. Pingback: Las Vegas 2011–Recap Part III « Meg.Goes.Nom.Nom. Pingback: Chicken Tetrazzini « Meg.Goes.Nom.Nom.